Mix the sugar and cardamom thoroughly in a small bowl. Place 2 heaping tbsp of sugar/cardamom mixture in smaller bowl and stir in salt. 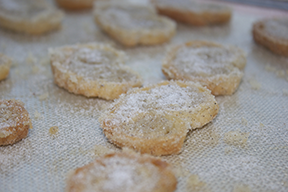 Spread some of the sugar mixture on work surface and place unfolded thawed puff pastry sheet on top. 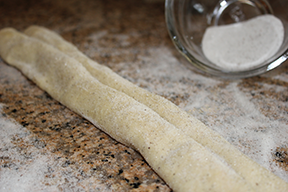 Sprinkle more sugar/cardamom mixture onto the top of dough. 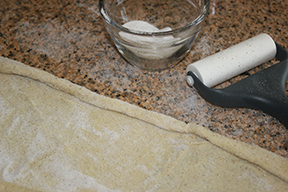 Roll dough out to a 10x14 rectangle, turning over and liberally working in more sugar/cardamom mixture. 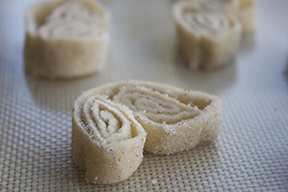 Sprinkle the top of rectangle with more sugar/cardamom mixture and lets roll it up. Starting on one long side fold edge and roll towards the center, stopping halfway. Repeat on other side. Cover gently in wax paper and chill in fridge for 2 hours. Remove dough from fridge and place on cutting board. Using sharp knife cut into 1/3” slices and place on un-greased cookie sheet. 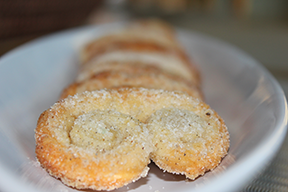 Sprinkle the tops of cookies with a little more sugar/cardamom mixture. Bake for 8-10 minutes keeping an eye on them in case they brown too fast. Remove from oven and turn them over and sprinkle them with a generous amount of the sugar/cardamom/salt mixture and bake for another 4 minutes until golden brown. Remove and cool on cooling rack.